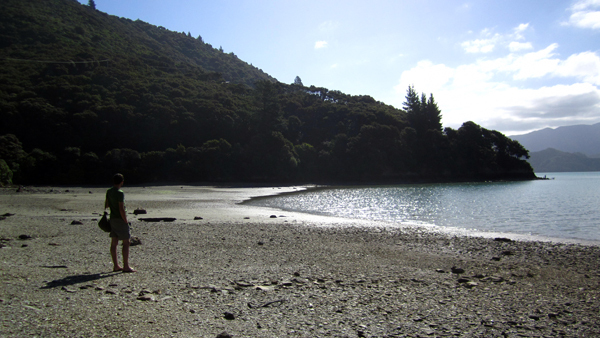 Our first stop on the south island was, a little campsite just north of Picton in Cowshed Bay. Our campsite was right on the beach, and I had a great time walking up and down the beach looking at all of the interesting little animals in the water. There were lots of starfish and crabs, and lots of clams, mussels and other shellfish. One evening we even saw some sharks swimming around at high tide. At low tide, we noticed a number of our neighbouring campers digging around in the sand for something. I went and asked anolder New Zealand couple what they were looking for, and they explained that they were finding some shellfish for dinner. I thought it was so cool, that I was quite determined to try it out myself. We got some tips from the Kiwi couple about which ones tasted the best and instructions on how to cook them. It was quite easy to find them, all you had to do was go into the shallows and dig until you felt something. We found many different types of shellfish and brought them over to the couple who showed us which ones were good to eat. At their recommendation, we ended up with a number of muscles and cockles. me), but they were tasty enough, and the best part was that we found them and cooked them on our own. We are able to buy New Zealand mussels in SA, very expensive but delicious, so you were fortunate to get yours fresh and for free, now you know how to harvest and prepare them you will probably try again if opportunity presents itself? Enjoy! Wish I was there. I would absolutley try again!